Nick Logan hopes to take over for the retiring minister who has groomed Nick for the job. But Reverend Ted seems to feel the position requires Nick to marry an upstanding woman, namely Ted’s niece. When Nick finds himself falling in love with Lily Draper, the woman least likely to become a minister's wife, his problems escalate. And when Reverend Ted gives him an ultimatum, Nick faces an impossible choice. The click of the door echoed as loud as a gunshot through the silent house. Lily Draper’s heart battled to escape her chest. She pressed her back against the cool wall of her father’s office and made a valiant effort to calm the roar of blood in her ears. No time for fear. Focus on what you’re here for. The familiar scent of cedar and moth balls threatened to swamp her with nostalgia, causing memories of her beloved mother to spring forth with a ferocity that spiked an ache of longing through her. Mama, how I wish you hadn’t died. If you were here now, my life wouldn’t be such a disaster. She pushed away from the wall, grim determination stiffening her resolve. She refused to dwell on thoughts of her mother, knowing how disappointed Mama would be with the drastic action Lily was about to take. She felt her way in the dark to the desk where she snapped on the brass lamp. Dust motes danced under the short beam of light aimed at the open Bible. With a pang, Lily ran her fingers over the worn pages. She used to love when Mama read her stories from the Bible. But that was before God took her mother away and left her with Tobias. With each punishment Tobias doled out, he cited a judgmental, angry God who waited to punish Lily for the least transgression. Lily wanted no part of a God like that. She shook her head to clear her thoughts and focus on her mission. Dirty coffee mugs and stacks of newspapers littered the surface as well as much of the floor. Obviously, her father needed a housekeeper, though she doubted Tobias would ever find someone willing to put up with his clutter or his surly personality. Not her problem. Hadn’t been for years. She pulled open each desk drawer, rifled through the contents, but didn’t find what she sought. Where did Tobias keep his emergency money? She fought to recall his routine when she’d lived here. A mysterious, metal box came to mind. The clock on the bookshelf ticked out its ominous threat. Hurry, Lily, it seemed to chant. Beads of perspiration slid down her back, gluing her T-shirt to her skin. According to the church website, Tobias’ weekly Bible study lasted two hours. Still, she needed to borrow the money and get out as soon as possible. If she were lucky, he would never even realize the money was missing until she could return it. Lily scanned the cluttered room, where long shadows danced over the piles of papers and books. The box could be anywhere. Her gaze swept past the long window shuttered by wooden blinds to the closet in the corner. She crept to the other side of the room and opened the door. A puff of stale air wafted out. Lily pulled the cord and a single light bulb flared, revealing an equally messy storage space. She moved the clothes aside, peered on the floor, and found nothing but shoes. She straightened, pushed up on her tiptoes, and brushed her hand over the shelf above. When her fingers met cool metal, her pulse jumped. She reached up to pluck the box from its resting place and carried it over to the desk. The lock wouldn’t be a problem. She had her penknife. One useful thing she’d learned from Curtis before he put a hole in her living room wall. She jimmied the lock with the thin blade and flipped the lid. The sight of a large stack of cash made her knees weaken in relief. Thumbing through the bills, she estimated over eight hundred dollars. If she were careful and found somewhere modest to live, this money could tide her over for a month or two—until she could put her wreck of a life back together. Lily didn’t know what made her look at the papers underneath. The documents seemed harmless enough, yet as she pulled out the first tattered page, nerves fluttered in her stomach. Could her self-righteous father have something to hide? Secrets that might prove he wasn’t so holy after all? Lily wet her dry lips. After all the torment he’d put her through, she had to find out. She opened the first page, a newspaper article from more than seventeen years earlier, describing a murder-suicide. A well-known doctor, David Strickland, had shot and killed his wife and two sons before taking his own life. Police found six-month-old Chloe Strickland unharmed in her crib but did not expect five-year-old Addie Strickland to survive. Lily frowned. What did this have to do with Tobias? She removed the remaining documents from the box. The first, a set of adoption papers, was of little interest. Her adoption was not news to her. The second piece, however, caught her attention. It took a moment to register that she was looking at her own birth certificate. Lily Adelaide Strickland. Mother: Margaret Ann Sullivan. Father: David Allen Strickland. The blood in Lily’s fingers turned to ice water. The man from the article—the man who had murdered his family—was her biological father? She snatched the article and re-read it. The older daughter…Addie Strickland…critical condition. They’d been talking about her. She was the girl not expected to live. But obviously, she had. Another more important detail burned into her brain—a baby girl had survived as well. Somewhere out there, she had a sister. A slow burn rose up Lily’s spine and settled into a tight band across her chest. Tobias had lied to her about so many things. About her birth family, about her real name, about how they’d come to adopt her. Her family hadn’t died in a tragic fire as he’d claimed—they’d been murdered. Worst of all, he’d never told her she had a sister. The papers floated to the floor as Lily grappled with the enormity of the discovery. Had Tobias kept this information from her mother as well? Or had Mama planned to tell her when Lily was older? Lily scrambled to the floor to retrieve the papers. Hunched over her knees, she read the article again. The date…seventeen years ago. Her sister would be almost eighteen by now. Where? Rainbow Falls, North Dakota. What were the odds that her sister would still be living in the same town all these years later? The sound of gravel crunching in the driveway seeped through the fog in Lily’s brain. A car door slammed. Lily jerked up from the floor. Tobias was home early. Panic clogged her throat and threatened to choke her. She jammed the papers and the cash into her purse, yanked the chain to turn off the lamp, and forced herself to think logically. There was no way to reach the back door without passing the front entrance. The only way out was the window. She wrenched up the blind, flipped the lock, and pushed open the window. With one leg over the sill, she glanced back at the darkened interior and then froze. The metal box sat open on the desk, the closet door ajar. Tobias would realize right away the money was gone. No time to worry about that now. She dropped onto the damp grass below the window, thankful for the high row of hedges surrounding the yard—even more thankful she knew a shortcut through the back alley to the street where she’d left her car. Ignoring the cold fear in her belly, she sprinted through a gap in the shrubbery and ran. Lily’s steps faltered the moment she pushed through the door into Hank’s Tavern. How was she going to do this? Say good-bye to the one person who treated her as though she mattered? The familiar smell of stale beer and barbecue sauce teased Lily’s nose as she crossed the floor. The loud hum of voices competed with the overhead TVs. Lily scanned the room, noting Tracy, the other full-time waitress, lugging a large tray of drinks over to one of the corner tables. For a Wednesday night, Hank’s place was uncommonly busy—probably due to the hockey playoffs. Lily walked farther into the bar, clutching her shoulder bag to her body, as if the unusual amount of cash inside would jump out and proclaim her a thief. “I’m fine.” Lily attempted a smile to reassure her boss. She didn’t want him asking a bunch of questions she couldn’t answer. “That low-life ex of yours isn’t bothering you, is he?” Behind the bar, Hank set down the towel he was holding. “No. Curtis won’t be back.” Now that he’d bled her bank account dry and gotten her evicted. Her gaze bounced around the room not knowing where to land. Two customers seated on stools at the bar did nothing to disguise their interest in the conversation. Lily swallowed before meeting Hank’s gaze. “I’m leaving, Hank. First thing tomorrow.” The heaviness of her lie weighed on her conscience like the leaden wad of cash in her purse. She’d be gone long before tomorrow. “Thanks.” Lily headed toward Hank’s small office in the back of the tavern, but her feet stalled. Ever since her landlord had evicted her two weeks ago, Hank had set up a cot for her there. Never once pressured her to get out or grumbled about the food she had eaten. Never even took a penny out of her pay. Hank was a good man—the only man she trusted—and she owed him everything. Lily changed directions and moved behind the bar to lay a hand on his arm. The tension in his jaw told her how much the news of her departure worried him. And it wasn’t about her job. He could replace her with a new waitress in minutes. Hank was like a father to her—the one Tobias should have been. His eyes widened. Knowing of her estrangement from the only family she had, Hank would understand the significance for her. In a small town like Rainbow Falls, North Dakota, decent lodging appeared to be a scarce commodity, unless you liked rats for roommates. This house would make the third rental property she’d seen since yesterday, and so far from the outside, it seemed the most promising. Maybe the third time would be a charm. It had to be. She was running out of options—and money. With unsteady hands, she adjusted the rearview mirror, reapplied a layer of strawberry-flavored lip gloss and patted her dark hair into submission. “That’s as good as it’s going to get.” She scowled at the smudges shadowing her brown eyes. What she wouldn’t give for one decent night’s sleep. Taking a deep breath for courage, she stepped out of the car and crossed the street to the flagstone walkway leading up to the house. A wide porch, complete with a wicker rocking chair, gave the building a homey feel. A pang of longing shuddered through her, but she shook it off. No time for regrets. She was here on a mission and needed to keep that at the forefront. Shoulders squared, Lily climbed the stairs to the front door and jabbed the bell, taking in the pot of pink geraniums in the corner while she waited. A cool spring breeze rustled her hair and lifted the collar of her thin jacket. Seconds later, the door flew open in front of her. “I can’t believe you’re on time for once—” The pixie-like woman in the doorway sported spiky red hair—definitely not her natural color—and large, silver hoop earrings. “Oh, you’re not Jason.” Wide hazel eyes held Lily in a curious gaze. “Of course you are.” The girl grinned, scanning Lily from the toes of her pointed shoes to the top of her windblown curls. Lily tried to shake the feeling she’d missed the punch line to some unknown joke. “That’s right.” Now they were getting somewhere. “Great. I hope you take it. We’ll be neighbors then. My name’s Maxi. Maxi North. Short for Maxine.” She held out her hand and smiled again, revealing two rows of even, white teeth. Lily frowned slightly and accepted the young woman’s outstretched hand. “I’m Lily.” The wary city-girl in her declined to give her full name. Lily turned. A battered red pickup jerked to a halt, and the driver’s door swung open. Lily wiped damp palms on her jeans. Please let things be better this time. She checked her thoughts. That had sounded too much like a prayer. Prayer, she’d discovered long ago, got you nowhere. “Hope to see you again, Lily,” Maxi said. “Oh, and don’t mind Nick. He’s a bit on the serious side.” With that, she waved to the man getting out of the truck before she disappeared inside. Lily clutched her shoulder bag, mentally preparing for the dreaded tenant interview, while Mr. Logan strode up the driveway. Her internal radar zoomed in on the fact that this was not the overstuffed bear of a middle-aged man she’d pictured. Clad in a light blue shirt, snug fitting jeans, and western style boots, this man could pass for an urban cowboy. Broad shoulders complemented well-muscled arms, hinting at work that included physical labor. When he reached the stairs, he pulled off a baseball cap to reveal a thick crop of blond hair. Intense blue eyes stared into hers then crinkled at the corners. Just the sort of good-looking complication she did not need now that she’d sworn off men. “Lily Draper?” His smile could stop traffic, even in a town the size of Rainbow Falls where none existed. When she nodded, he held out his hand. “Nick Logan. Hope I didn’t keep you waiting.” His deep voice slid over her like silk. Question 1: This novel explores the theme of worthiness. 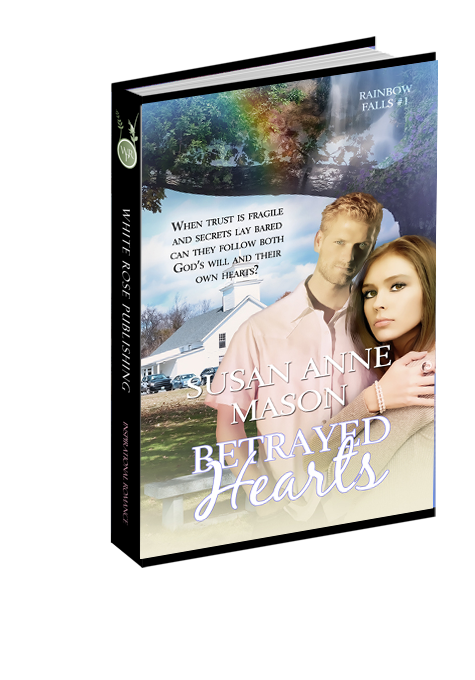 Lily's adoptive father has always made her feel like she was never good enough. How does Nick's love make her see her inner goodness and worthiness of God's love? Question 2: Another theme explored in this story is forgiveness. Lily tries to forgive her father for his emotional abuse and let go of the bitterness that haunts her. Is she wrong not to help him when she learns he is dying? Question 3: Lily's greatest desire is to be part of a loving family, something she hasn't experienced since her mother died. How important is family in shaping the person you become? How does God use the early seeds of love provided by Lily's mother to grow Lily's faith? Question 4: Nick has overcome physical abuse by an alcoholic father and has embraced his faith instead of turning away as Lily did. How has this helped him to overcome his emotional scars and be able to help Lily with hers? Question 5: Nick is forced to make a very difficult choice between the minister position he's been working toward and the woman he's falling in love with. Do you think Nick made the best choice? Do you think he made the choice God wanted him to make? Question 6: Characters like Sarah Jane and Tobias wear their 'religion' like a badge of honor, but fail to demonstrate a real Christ-like compassion and love for others. Compared with Lily who views herself as a bad person, who is the more Christ-like? Question 7: Maxi North is a quirky character who shows Lily the true meaning of friendship. Do you think God places people in our lives for a purpose? Question 8: Lily makes a big sacrifice and gives up her need to tell Chloe she is her sister. How does this show Lily's true nature? Question 9: When Lily is arrested and Nick tries to reach out to her, she treats Nick badly, seeming to revert back to her hardened self. Nick doesn't give up on her, but works on ways to help her, reflecting how God never gives up on us either. Has anyone ever showed you this type of loyalty in times of trouble, even when you may not have deserved it? Question 10: When Lily is released from jail, all her friends from Rainbow Falls are there to welcome her. How does having a sense of community support add value to your life? Conversely, when society shuns someone, can you understand why they might become hardened and bitter?